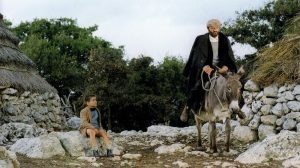 “The Tavianis most important work is Padre Padrone (aka Father, Master), based on a memoir by the academic linguist Gavino Ledda about his harsh upbringing as the son of a psychologically and physically abusive peasant farmer in postwar Sardinia, and how he came to create his own life. Taken out of school aged six, Gavino is forced to take care of the family’s sheep in the mountains and at the age of 20 is illiterate. Then family circumstances force him to join the army. There he drops his local dialect, learns to read and write and is inspired to go to university and make a forcible break with an oppressive patriarchal tradition.